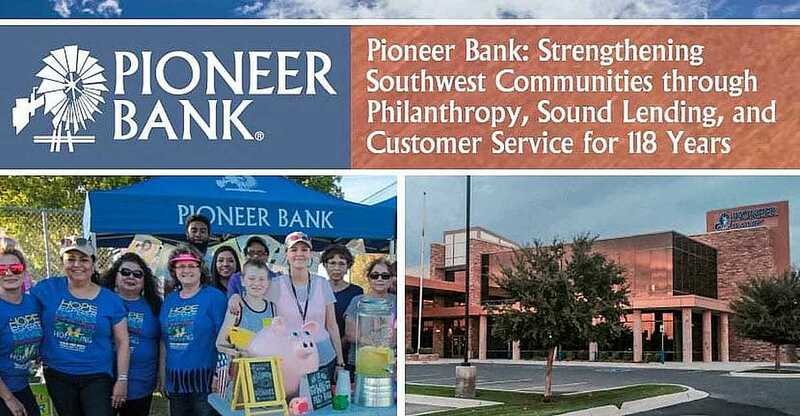 In a Nutshell: Since 1901, Pioneer Bank has helped the people of the Southwest by providing products and services that foster community well-being. The bank’s investments in real estate development and local business growth translate into job creation, affordable housing, and increased public revenue. 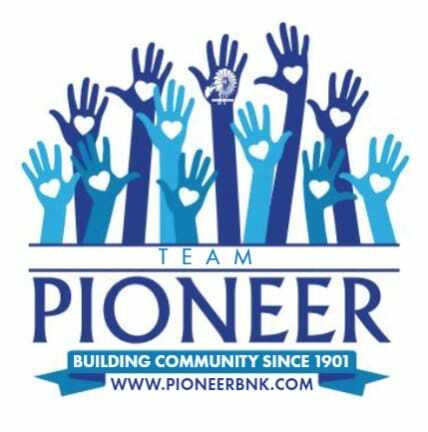 And through its Team Pioneer program, the bank donates resources to hundreds of community nonprofits, with its employees volunteering more than 2,600 hours of their own time in 2018 to back up those efforts. For going above and beyond to help its communities thrive, Pioneer Bank has earned our Editor’s Choice™ Award for Community Commitment. Each year as spring turns to summer in Roswell, New Mexico, Pioneer Bank employees gather with friends and neighbors at the Chaves County Walk for Hope to support individuals and families touched by cancer. The walk started in 2010 and quickly grew into one of the area’s premier fundraising events, attracting thousands of participants. And Pioneer Bank has been there every step of the way. The Chaves County Cancer Fund distributes all money raised by the walk to local individuals and families struggling with a cancer diagnosis or outcome to help them pay for living expenses. Pioneer’s participation is one of the many ways the bank donates time and resources to support the communities it serves. All told, Pioneer’s lending impact in 2017 was nearly $240 million. And more than 100 local nonprofits, like the Chaves County Cancer Fund, receive donations and fundraising support from the bank each year. For helping people in its service areas build stronger communities since 1901 — and backing those efforts with its own resources — Pioneer Bank has earned our Editor’s Choice™ Award for Community Commitment. Pioneer Bank customers benefit from top-shelf technology infrastructure including services like electronic and mobile banking that are on par with the biggest national banks. At the same time, Pioneer’s personalized approach to customer service means that bank associates know many regular branch visitors by name. That emphasis on customer service also extends to Pioneer’s community service. After Pioneer Bank President and COO Christopher G. Palmer served as 2018 president of the United Way of Chaves County, every member of the bank’s executive team has also served as a board member or participant in at least one local nonprofit. Pioneer also fosters a vibrant workplace culture that encourages employee volunteerism. Every day, bank executives work side by side with employees to benefit local areas. In 2017, Pioneer formalized its commitment to communities by creating the Team Pioneer program, an internal structure enabling nonprofits to request support from the bank. Priority is given to broad-based projects and activities that support affordable housing, educational initiatives, financial literacy, and that offer an opportunity for Pioneer employee volunteer involvement. Leveraging the diverse Pioneer workforce with its various strengths, skills, and connections, Team Pioneer facilitates volunteer contributions to special events, community kitchens, work days, and hands-on volunteer projects. The bank also offers financial management expertise, board service, and fundraising impetus to organizations. Through Team Pioneer, employees serve as valuable bank ambassadors dedicated to helping communities and promoting positive change. Juliana exemplifies that focus on the community. 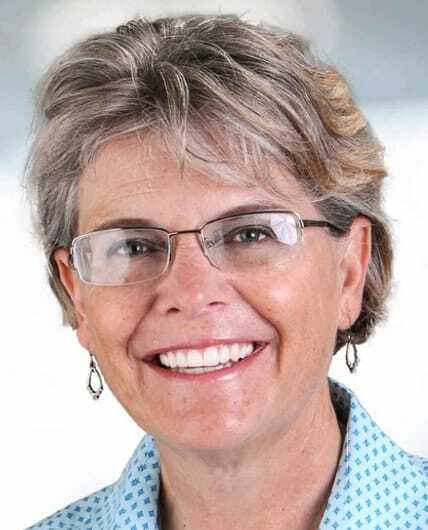 In addition to her responsibilities at the bank, she serves as Vice President of MainStreet Roswell, which works to develop and maintain a vibrant local economy by attracting people to Roswell’s downtown area. A healthy downtown business climate, MainStreet Roswell believes, draws local and regional customers and benefits businesses throughout the region. Juliana Halvorson, Pioneer Bank’s Vice President of Marketing, spoke with us about helping communities throughout the Southwest. Pioneer Bank is a Friend of MainStreet Roswell — one of several corporate sponsors of the organization. Building on the support of Pioneer and other local businesses and organizations, MainStreet Roswell leads efforts to beautify downtown Roswell to help it draw tourists, impart community pride, and keep dollars local. Working on the premise that a vibrant downtown is healthy for a community, MainStreet Roswell sponsors events and festivals, enhances public spaces, and recommends strategic improvements. “We help out with MainStreet Roswell in many ways. Community Planting Day is always a highlight of our charitable year,” Juliana said. On Community Planting Day, which is held each spring, Roswell residents gather to fill planters located on the town’s Main Street with flowers supplied by the organization. It’s a kid-friendly event that signals the dawn of new growth — in more ways than one. In addition to sponsoring a host of events, MainStreet Roswell operates a summer farmers market on the Chaves County courthouse lawn and holds a Small Business Saturday every year before the holidays to encourage folks to shop for gifts locally. Financial consumers looking for a service-focused alternative to large institutions — where they can ensure their dollars stay close to home — can find the complete package at Pioneer Bank. In addition to housing its corporate headquarters and several branches in Roswell, New Mexico, Pioneer operates branches in Alamogordo, Carlsbad, Hobbs, Las Cruces, and Ruidoso. And Pioneer makes an impact in each city. On the financial side, businesses and consumers alike know that working with Pioneer means securing a brighter future in a region where growth and progress depend on the input of local institutions. When everyone in a community is on the same page in terms of development, good things happen. For creating a community support effort that exemplifies the importance of working together to encourage a strong economy and build for the future, Pioneer Bank has earned our Editor’s Choice™ Award for Community Commitment.